Thunderball (1965) is the fourth spy film in the James Bond series after Dr. No (1962), From Russia With Love (1963) and Goldfinger (1964), and the fourth to star Sean Connery as the fictional MI6 agent James Bond. It is an adaptation of the novel of the same name by Ian Fleming, which in turn was based on an original screenplay by Jack Whittingham. It was directed by Terence Young with screenplay by Richard Maibaum and John Hopkins. The film follows Bond's mission to find two NATO nuclear bombs stolen by SPECTRE, who holds the world to ransom for £100 million in diamonds, in exchange for not destroying an unspecified major city in either England or the United States (later revealed to be Miami). The search leads Bond to the Bahamas, where he encounters Emilio Largo, the card-playing, eye-patch wearing SPECTRE Number Two. Backed by the CIA and Largo's mistress, Bond's search culminates into an underwater battle with Largo's henchmen. Thunderball was associated with a legal dispute in 1961 when former Ian Fleming collaborators Kevin McClory and Jack Whittingham sued him shortly after the 1961 publication of the Thunderball novel, claiming he based it upon the screenplay the trio had earlier written in a failed cinematic translation of James Bond. The lawsuit was settled out of court and Albert R. Broccoli and Harry Saltzman fearing a rival McClory film allowed him to retain certain screen rights to the novel's story, plot, and characters. The film had a complex production, with four different units and about a quarter of the film consisting of underwater scenes. The film was a success, earning a total of $141.2 million worldwide, exceeding the earnings of the three previous Bond films and breaking box office records on the first weekend of opening in France and Italy. In 1966, John Stears won the Academy Award for Best Visual Effects, and production designer Ken Adam was also nominated for a BAFTA award. Thunderball is to date, the most financially successful movie of the series and adjusting for inflation made the equivalent of $966.4 million in 2008 currency. 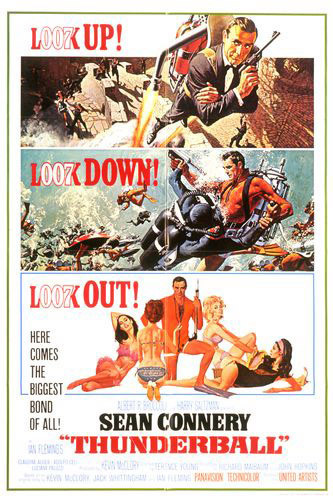 Although a commercial success, Thunderball received mixed reviews from critics. Some critics and viewers showered praise on the film and branded it as a welcome addition to the series, while others complained of the repetitively monotonous aquatic action and prolonged show duration.